Luciana entry level burning laser pointer is able to light matches and pop balloons, and the 200mW laser is able to engrave on plastics. Luciana lasers are good as starters. If you need more powerful lasers, you may find our Real 1W-5W handheld burning laser pointers are better options. Lower divergence(0.5 mRad); beam distance is greater than 7 miles; able to light a black match with the tiniest cross laser beam. Divergence is 1.2 mRad; green laser beam distance is about 10 miles; able to light matches, pop balloons, engrave on plastics, the violet laser is able to burn a hole through black papers. Brighter than violet lasers, weaker than green lasers, its burning ability and beam range are also in the middle. Brightest, longest beam distance, commonly used in outdoor occasions, e.g. astronomy star-pointing, tourism, camping. Laser beam is not as bright as red or green lasers, but it is more capable of burning things, 3X faster than green lasers when lighting matches. The laser lens is fixed, other lenses can not be mounted. You can see a linear laser beam and a small laser beam spot. The laser lens can be changed, comes with 1 starry pattern lens, rotating which, you see a wall of stars twinkling. When the starry lens is removed, it works like the non-interchangeable fixed lens laser. 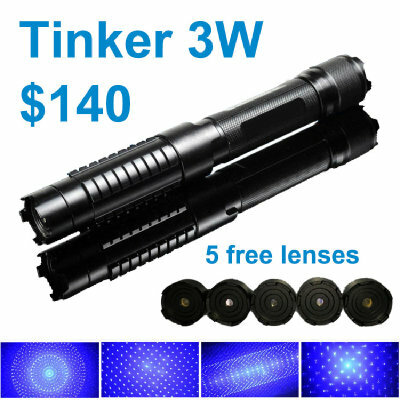 The laser lens can be changed, comes with 6 lenses, giving different laser effects: galaxy, grid, time tunnel, radial, strips. Please refer to the animated gif at the bottom. The Lucinda series are entry-level burning laser pointers(200mW). They are good for starters. If you are a sophisticated user, you may find our 1000mW 2000mW 3000mW 5000mW high power handheld burning laser pointers are better options. They are more powerful, able to burn papers, leaves, leafstalks, stems, wood pieces, etc. Are you interested in this Blue Burning Laser? Are you interested in this Burning Laser?